Bookplates are a declaration of ownership placed inside the front cover of a book. Because many of them include the Latin phrase Ex Libris (from the books of), sometimes bookplates are also referred to as ex libris. These labels encourage the return of a lost or stolen book, can be representative of the owner's lineage and identity, and often reflect the style of the era in which they were created. Before the age of printing, books were rare and therefore valuable. Bookplates began as simple inscriptions to establish ownership in the Middle Ages, and evolved toward more elegant and deliberate designs through the Jacobean and Edwardian periods. Artists were commissioned to design and create them with woodcuts, copperplate and steel-plate engravings, etchings, or lithographs. As books were precious, and often passed on to family after the death of the owner, heraldic designs like those on display in this case were a common choice for bookplates. They were sometimes colored by hand to emulate the pages of illuminated manuscripts, and in the eighteenth century, the influence of silver design and banknotes can be seen in many of the bookplates' style. The latter half of the nineteenth century saw an increase in bookplate production as doctors, lawyers, and other members of the upper classes wanted to mark their books as a source of pride. 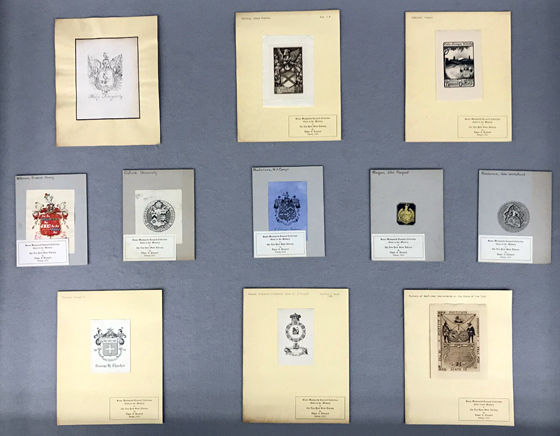 The presentation of these later bookplates departs from heraldic associations, instead diverging into bookplates that celebrate the owner's occupation, achievements or personal interests. The bookplates in this case featured designs focused on nature and outdoor activities. 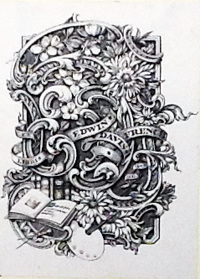 Of course, books and reading were also a popular theme in bookplate design, as in many of the examples in this case. As bookplates became more artistic in design, they also became collectible in their own right. By the end of the nineteenth century, collecting and exchanging bookplates had become a common practice, with the peak of bookplate collecting occurring from approximately 1890 to 1925. Exchanges were often conducted with duplicates of the owner's own bookplates, and some book owners commissioned bookplate designs for the sole purpose of exchange. A number of societies for bookplate collectors were established near the close of the nineteenth century: the Ex-Libris Society formed in London in 1891, followed by the Washington Ex-Libris Society (later the American Bookplate Society) in 1896. This society, the first in the United States, offered annual publications and presentations for members until 1925. 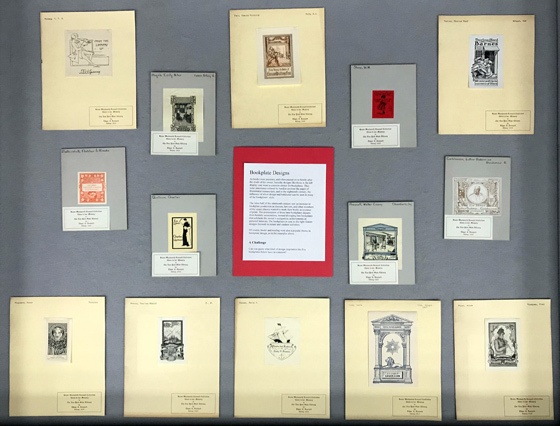 Although both the use and collection of bookplates has decreased since then, bookplate collectors and societies are still active today—over 30 international societies of bookplate collectors meet biannually, unified under the International Federation of Ex-libris Societies (FISAE). 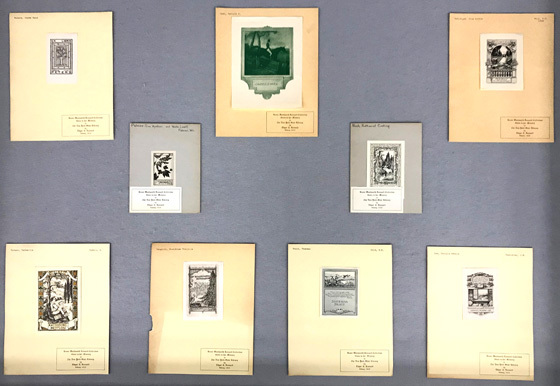 All of the bookplates in this exhibit are from the Bessie Woolworth Leonard Bookplate Collection (PRI 5426), which was donated to the NYS Library as part of a larger collection of Elizabeth (Bessie) Leonard's papers. Bessie Leonard (1862-1925) collected bookplates for a period of about 20 years, during the peak of their popularity, accumulating a collection of about 500 bookplates, mostly American, from both individuals and organizations. 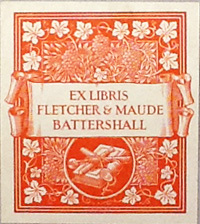 Many were obtained through exchanges for her own bookplate. 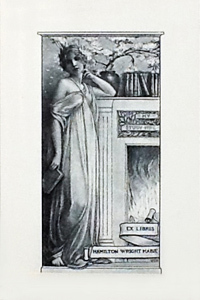 The value of a bookplate is often derived from the artist who designed it, rather than the individual who commissioned the work. In her later years of collecting, Mrs. Leonard specialized in bookplates by well-known designers of the period, notably Elisha Brown Bird (who designed Mrs. Leonard's bookplate), Edwin Davis French, Sidney Lawton Smith, and J. Winfred Spenceley, many of whom became known as the "Little Masters" of copperplate engraving. 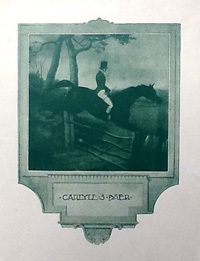 Spenceley was known for his expertise in depicting scenes from nature, Smith for using his knowledge of illustration from his work in publishing, and French for combining etching with engraving techniques. One of French's own bookplates (right) is among the examples on display. Some of the bookplates in this collection have also been featured in the NYS Library's Instagram account; you can find them under the hashtag #bwlbookplates.